Protoje born Oje Ken Ollivierre is the son of a well known Jamaican singer, Lorna Bennett whose 1972 version of Breakfast In Bed is a classic that was covered and became a big tune years later by both The Pretenders' Chrissy Hynde and UB40. The child of two music industry parents, his father is a former Calypso King from St. Vincent, Michael 'Lord Have Mercy'. In 2010 he began working with his cousin, the notorious hit making producer, Donovan Don Corleone Bennett. In 2011 they released Protoje's first album The Seven Year Itch and have now followed up with this highly-anticipated set. Hitting his early 30's in stride, this artist has big dreams and big shoes to fill. With comparisons to Bob Marley, Protoje uses the foundation of reggae and fuses it with principles from Hip-Hop and Pop music. But why the comparison to the original Tuff Gong? One could suggest that it is perhaps his voice, which is not the most forceful say as some of reggae's great singers, but has an honesty about it combined with razor sharp phrasing and most significantly, song themes, hooks, and ideas that are unmatched by any other, not just in reggae, but also on the international pop scene today. The record starts out with the title track 8 Year Affair in a mellow pace, building the vibes, telling the tale, setting the stage with the sweet tones of what sounds like guitar played by the likes of maestro Earl "Chinna" Smith, intertwined with soothing sounds of the flute. The lyrics illustrate the responsibility that the artist has recognized, that burden of the next generation, as he plays tribute to some of his heroes, "that spirit of Jacob that spirit of Hugh" (referencing Jacob Miller and Hugh Mandell) "that spirit of Mackintosh" (Peter Tosh) "that spirit never move. The spirit of Marley that spirit fought….". 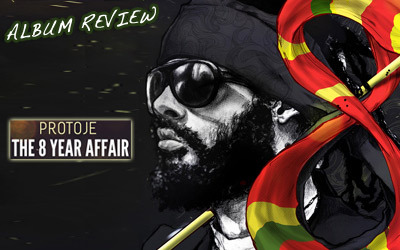 With a riddim and lyrical interpolation reminiscent of Black Uhuru's crucial track, Happiness Protoje chants inna deejay style showcasing his versatility mixing it with a catchy chorus out-lining the "Iyatta" rasta style patois language on the tune I&I. Any artist that can use the name of one of my favorite Jamaican sweets the greata cake, a coconut tart delight is someone I would like to give a deeper listen to. This tune offers a roll call of the various houses of rasta, its spiritual leaders, its teachings and Protoje's laser focus on the essential message of "all love we livin' in". Next up is a warning to the Kingstonians on Kingston Be Wise, another tune reminiscent of Sly and Robbie's grooves. This song theme and the groove are actually an interpolation of the Ini Kamoze song England Be Nice and the artist's delivery and the production style are both loud echoes from the past. The lyrics call for calm amidst the gun violence and the concerns of what are actual developing world problems of the slum dweller with direct call to Kingston to "Just be wise and free up the I". The most precious tune on the release for this reviewer is Hold You Now, a revolutionaries' love song, a sweetly presented proposal, with it's intro, "This one is for my city girl", a wonderful offer for a ride to country with Oje, where he offers to, "Let me take you from a place where, the politicians dem no play fair, brainwash the youth dem from the day care". The groove is silky hip-hop with soulful horns, 'criss support vocals that fortify a convincing hook and verse, "you nah go wan fi go back home". By 2:50 into the song, he gives the rastaman treatment to his woman's virtuous moves including her fashion choices, giving a shout out to the Mamayashi brand, a boutique label based in Jamaica that is rootsy and cutting edge from Kingston to Brooklyn. Moving deeper into the romantic love theme, the combination Someone Like You features the powerhouse pipes of Tessane Chin, whose delivery is sweet yet sultry in complement to Protoje's vocals, as they yearn for that special someone to replace or duplicate an unattainable love interest. What follows is a next combination over a poppy hip-hop groove with Chris Watts on Around The World that seems to follow this same theme, that no one can compare to the "one" that is at home, while the artists have "been around the world and back, seen a lot of girls that's hot". As Protoje reassures the love/muse at home who may be feeling unsure by asking, "my muse for my music how could I go lose it?". On Who Dem A Program Protoje chants over a keyboard-tinged hip hop jam, maintaining a sharp cypher and contention about Babylon, asking "a who dem a have them eye pon?". Then there's the obligatory weed song with its witty title, This is Not a Marijuana Song, its well-crafted, with effortless flow, soaring female support vocals and a recognizable vintage riddim, matched by mindful lyrics about not abusing the sacred herb while suggesting that "they don't want you to know marijuana". The songwriter and vocalist and just all around great youth, Romain Virgo teams up with Protoje for an important ode to what is being called the 'Reggae rebirth' on Reggae Revival. Romain a sing say, "It's blazing up in my head, keeps playing while the music a spread, don't you hear what I said, how reggae music fi dead?". The two artists play tribute to this vital art form and their predecessors with a driving, sparse groove, not quite a one-drop bubbles and simmers. That is not the type of record that Protoje is making, one that is in your face reggae or dancehall, he is really a Reggae 2.0 type of artist, one that sees the future and respects and sources from its rich past. Romantic love themes are continued on the combination with female vocalist Toi on Shot By Love. This tune makes playful gun references through lyrics like "l've been shot in my heart, they call it love in the first degree". The groove is textbook Don Corleon, just a supreme track full of vibes. Another one from the vaults of yesteryear is the sample of the chorus and remade groove for Errol Dunkley's Black Cinderella. This tunes lyrics have several a clever uses of the popular fairytale suggesting that the girls in Jamaican culture are perhaps growing up too fast, "Young girl wear your size cause those shoes don't fit your feet." A true rastaman, Protoje's devotional, Hail Ras Tafari with its Waterhouse style vocal trills is rich with memorable, intentional lines like, "Even in the drought I no cry, these are the times I hail Rastafari, knowing that Jah will provide for I". And as the record closes out with the 5+ minute long one drop, Music From My Heart taking its place as the finale in the thoughtful album sequence, we are reminded that this artist has many more songs under his tam, that he is making music from his heart, "not music for the charts". He says to Mumma Lorna, "Mommy if I never win a Grammy don't you cry for me no billboard up in the sky for me…" and "If I never get to put a plaque on Don's wall, I'll appreciate the fact that even one sold". And in tribute to his father, he asks, "Daddy do you see yourself when you look at me? I look at you and feel like that is what I've got to be". An artist for the people and for the times, Protoje, how refreshing!